If you don't know who Nikos Galis is, please visit Stuart's wonderful Nikos Galis Player Profile from the main InterBasket.Net page. One of the best players of all times in Europe. I don't say this because he is Greek, but because that is the case. He was voted as the best European player in 1987-8 (?). In fact I remember that Alexander Petrovic (brother of Drazen Petrovic who was also a candidate for the prize that year) said: "Drazen is my own brother, but I confess that I voted for Galis!!" Galis was born in the States by Greek immigrants (from the island of Rhodes) and graduated from Seaton Hall. His original name was Georgalis but while in the States his parents changed it into Galis (Geor- Galis) so that was easier for the Americans to pronounce it. He came to Greece and joined Aris Thessaloniki in the mid 80's. Aris won countless trophies while Galis was there, and played 3 consecutive F4's of the Euroleague. Also Galis was the leader of the Greek NT when they won the Eurobasket of '87 beating the Soviet Union in the final and Yugoslavia in the semis. He is the all-time first scorer of the World Championships, Euroleague's F4's and of other competitions which I can't remember. He joined Panathinaikos in the early 90's and this was the beginning of the "greens" revival, both in Greece and in Europe. Unfortunately he ended his career after a fight with his coach in Panathinaikos. He left the bench during the game (against Pangrati, I think) and he never came back. Undoubtedly he's the greatest Greek player of all times. In fact the OAKA stadium (the biggest in Greece) will take his name, as it was announced recently. The best of the best, the player who changed the history of Greek basketball and put us on the map. Nick was the all-time leading scorer of Seton Hall until recently but I have no idea if anyone has passed him. He was drafted by the Boston Celtics but he never played in the NBA so he came to Greece to play for Aris Thesaloniki. When he first came he had this huge afro hairstyle and from the beginning all he did was score, and score and score. When the other legend of Greek basketball Panagiotis Giannakis joined Aris, they built an empire that won many championships in Greece, went to the 3 first European Final 4s but they never won the European title. The legendary coach Giannis Ioannidis then left the team and the empire collapsed. Giannakis later won the Euroleague in 1996 with Panathinaikos but neither Galis nor Ioannidis did (even though Ioannidis went to 3 more F4s, 2 with Olympiakos and 1 with AEK). Galis led the National team of Greece to the European title in 1987. 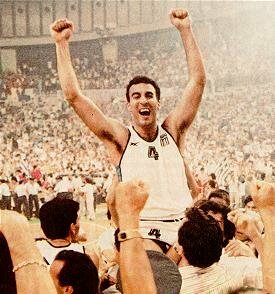 After Greece won Italy at the quarterfinal they asked Galis if this was the greatest moment in his career and he said "the greatest until tomorrow". 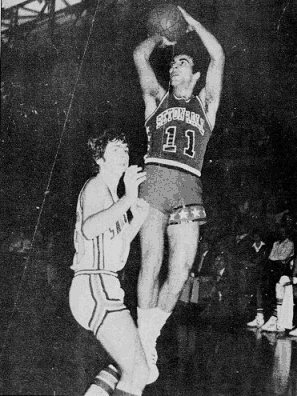 Then Greece won Yugoslavia at the semifinal and USSR at the final 103-101 with 2 free throws by Argiris Kabouris. Then 2 years later in Yugoslavia Greece went to the Eurobasket Final again, this time winning USSR at the semifinal...We (Greece) were a country of 8 million people and the USSR was a country of 250 million people and we had won them twice in two years with Nikos Galis dominating the superstar Arvydas Sabonis. It was like a battle between David and Goliath. I'll never forget that game. Now Galis, who kept playing competitive basketball until his late thirties when he retired because of a fight with his coach, has a basketball camp in Halkidiki, where he teaches the children how to play the game. He never tried to become a coach and has been rather quiet about his life. For years after he retired there were rumors he would could come back and save Aris but he never did. For me he is the best European basketball player ever, a real legend and the Michael Jordan of Greek basketball.